PASCO – The Spokane Indians regained some momentum in their bid to make the Northwest League playoffs, defeating the Tri-City Dust Devils 15-7 on Thursday night. Diosbel Arias made sure of that, driving in five runs with two doubles. Curtis Terry added four RBIs, Jax Biggers had four hits and scored four times, Sherten Apostel drove in three runs and Hasuan Viera collected three hits and three runs. 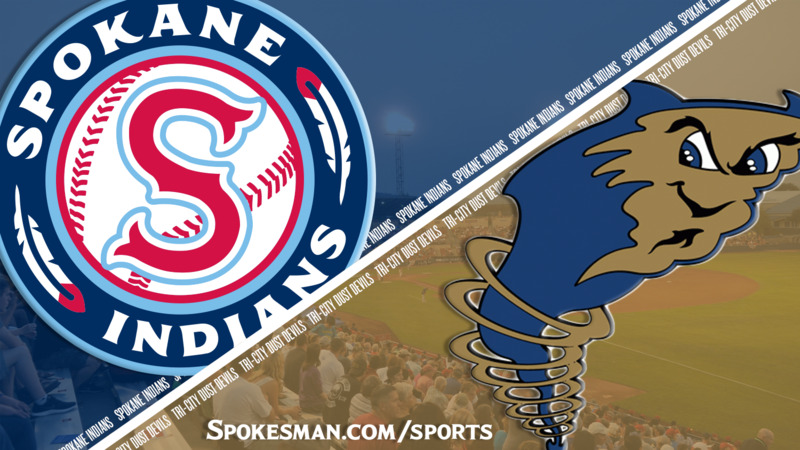 Spokane’s win, the follow-up to a 5-3 loss to the Dust Devils in Wednesday’s series opener, leaves the Indians (19-15) one game behind North Division first-place Vancouver (20-14) with four games remaining in the regular season. Vancouver lost to Everett 8-1. Vancouver visits Spokane for three games beginning Saturday to close out the regular season. The Indians took an early 3-0 lead against Tri-City. Back-to-back first-inning doubles by Arias and Sherten Apostel resulted in the three-run lead and the Indians tacked on two in the fifth and three in the sixth. Tri-City scored single runs in the second and third innings. With Spokane leading 8-2 in the seventh, the Dust Devils scored two runs and had runners on first and second with nobody out. Indians reliever Seth Chandler entered and stymied the rally, though one of his inherited runners scored. Wes Robertson came on in the eighth and Kyle Keith finished the game. Now leading 8-5, the Indians broke the game wide open again. In the eighth, Arias delivered a three-run double. The ninth was a scorekeeper’s nightmare as Tri-City opened the inning with two errors and the Indians scored four runs, the last two on bases-loaded walks to Curtis Terry and Apostel. Tri-City scored a run in the ninth on a bases-loaded walk issued by Keith, his third bases-on-balls in the inning. Augustin Ruiz struck out to end the game. Rehab assignment: Alex “Chi Chi” Gonzalez, former Indians and Texas Rangers starter, will make a rehab appearance with the Indians on Sunday against Vancouver. A former first round pick in the 2013 MLB Draft, Gonzalez underwent Tommy John surgery in July 2017. He is expected to pitch for Licey in the Dominican Winter League. Year-end honors: Indians 1B/DH Curtis Terry was named Northwest League Most Valuable Player and first-team first base on its year-end all-star team. Terry, 21, leads the league in home runs (15), RBIs (56), total bases (143) and slugging (.616). His RBI total is 16 more than his closest competitor with five games to play. Terry is hitting .336 with a .430 on-base percentage, both second in the league to teammate Diosbel Arias (.372/.459/.493), who was named first-team shortstop on the year-end all-star team. Published: Aug. 30, 2018, 11:02 p.m.